Craftsmen and trade workers will tell you that the best claw hammer depends on the job you are working on. A long-handled hammer allows you to drive nails faster and apply more leverage when pulling, but there are always occasions when a shorter handle lets you get into difficult spots. Even the hammer head makes a difference, as a milled face tends to give more traction, while a smooth face will not mar the surface of soft wood and other surfaces. To that end, each of the top picks presented here can be considered the best depending on the use. 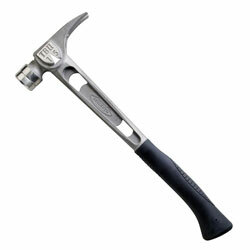 Having a couple different types of hammers in your tool collection will also prove to be useful. 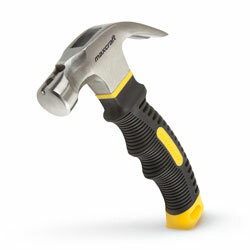 Estwing is one of the most popular claw hammers for framing, sheeting and other carpentry. To prevent breaking, the handle and head are forged from a single piece of solid steel, and the long, straight claw is handy for prying and pulling. At 13 inches long, it gives you more leverage for faster driving, and the cushioned vinyl grip will let you hold the handle for long periods without causing muscle cramps or exhaustion. The E3-16S has a smooth face that allows uniform dimpling on drywall and won’t leave unpleasant marks on pine or other soft woods. While it’s great for many jobs, it may not have the weight for heavy framing or forming. If you need an all-purpose hammer or one that will never let you down sheeting or doing trim, this hammer can’t be beat. 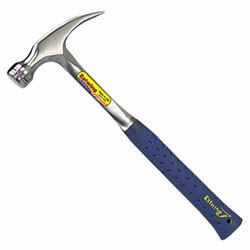 But you should look at a 22 ounce or heavier hammer for framing walls or driving into pressure treated lumber. You should never attempt to pry from the side of head with any hammer, especially a solid metal shaft which could bend, ruining the balance and precision. Manufactured from lightweight titanium, the Stiletto TB15MC is a top-of-the-line claw hammer when it comes to versatility. The ergonomic design causes less fatigue (bye bye carpal tunnel), while the titanium shaft reduces recoil and creates more leverage, doing the work of a 21 or 24 ounce hammer without the muscle stress. The TiBone 15 ounce comes with a milled face, but it also offers the unique capability of interchangeable faces, so you can swap out for a smooth face when the job demands it, and the magnetic nail starter of the milled face is ideal for overhead work and situations where you can only use one hand to get things started. On the down side is the price which is the only reason why it’s not our number one pick. 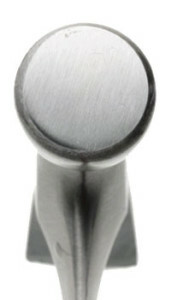 Also, the rubber handle grip only covers the lower end of the shaft, which limits your gripping options. If you are serious about your tools, want the best, and are willing to pay a premium, this Stiletto is what you’re looking for. For working cabinet work and other projects which require a hammer in close quarters, the Maxcraft 60626 is a dream come true. At only about 6 inches long, this may be one of the most useful hammers you come across for that type of project, and the smooth face means you won’t mar soft cabinet or trim materials. Is has the same parts to a hammer but just at a smaller scale. Since this hammer is designed for confined areas, the magnetic head can be a lifesaver, allowing you start nails one-handed instead of trying to squeeze one hand and a hammer into a tiny opening. It’s also a good little hammer that will actually fit in the kitchen junk drawer if you just want to hang a picture on a wall without having to go to the garage. On the other hand, the Maxcraft Stubby Claw is almost useless for driving large nails or working with pressure treated material because it only weighs 8 ounces and does not provide enough leverage to make up for the lack of weight. It is great for odd jobs around the home as as a tool to keep with your camping gear, but will disappoint if put to heavy duty use.